Welcome to what is fast becoming a busy season for Doug and Derek Preston of DP Turf. Doug and Derek Preston have been providing custom Turf and Landscaping solutions for the past 25 years! Accomplishing large and small scale projects with a devout commitment to excellence and outstanding customer service they continue to grow. Current installs and jobs underway: Winchester MA a Southwest Greens Preston Design 9 Hole Course; includes youth sport through pro cup and putting green placement, Point of Pines MA – Custom Design Synthetic Lawn Installation, Southborough MA a Southwest Greens backyard putting green, Synthetic Lawn Installation in Cambridge MA , Tee Line at Blue Hills Country Club-Canton MA, and a large scale job in Concord MA and with more coming in each week – we will have a lot to share with you! DP Turf uses Southwest Greens to create the artificial home golf greens made of high quality polyethylene material. This material makes our synthetic golf green versatile and helps it move just like natural grass. 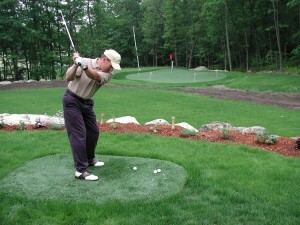 Our residential golf green is the perfect replacement for your natural grass lawn. Your kids will have hours of enjoyment on our beautiful synthetic turf. Our home golf putting green is the best replacement lawn available. You no longer have to worry about your water bill getting out of control. Our home golf green is low maintenance and long lasting. Get yourself an artificial golf green today. Home golf green and synthetic golf green sound good to you? Wouldn’t you like to practice your game on a custom golf green, your better yet—your own residential golf green? The increase of interest for people wanting a home golf putting green is unbelievable! The synthetic turf industry is booming, and artificial greens are fast becoming the wave of the future when it comes to golf greens. With water conservation in mind and the desire to play more and work less on maintaining a real grass green, a residential golf green is sounding better and better. Unlike other backyard entertainment amenities, home golf green installation using synthetic turf requires very little of your time to keep it at its optimum condition. Start shopping for your home golf green today. DP Turf would be happy to provide you with an estimate on a residential golf green. Call us today for more information on synthetic turf and how you can enjoy the benefits of your own artificial home golf green. Artificial grass and artificial grass lawns are great for anyone that wants beautiful looking, maintenance-free grass all year long. Whether you need commercial or residential artificial grass, or are looking for golf green installation in your backyard, we offer the best artificial grass installation in the business. Artificial grass from DP Turf is the perfect solution for homeowners and businesses located in areas that experience extreme weather conditions. Our artificial grass lawn will withstand the heat and the cold and never gets muddy or soggy from heavy rain. It is also the ideal alternative for grassy areas that take a beating from heavy use or places that are particularly difficult to maintain under normal conditions. Our residential artificial grass and golf greens are engineered for durability, performance, and appearance, and no other artificial grass installation can equal our reliability. 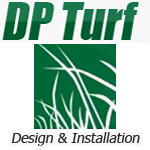 DP Turf has extensive experience in the artificial grass industry as the leader in designing and installing more than 6,000 professional-caliber golf greens worldwide. We are pleased to bring our vast product knowledge, design skills, and installation expertise to your lawn and landscaping needs. We have the “know how” to handle even the most demanding terrain, slopes, and contours. We will work with you to create the perfect year-round lawn. For the best in commercial and residential artificial grass, as well as backyard golf green installation, there is only one artificial grass installation team you can rely on. Contact DP Turf now for all your artificial grass lawn needs.